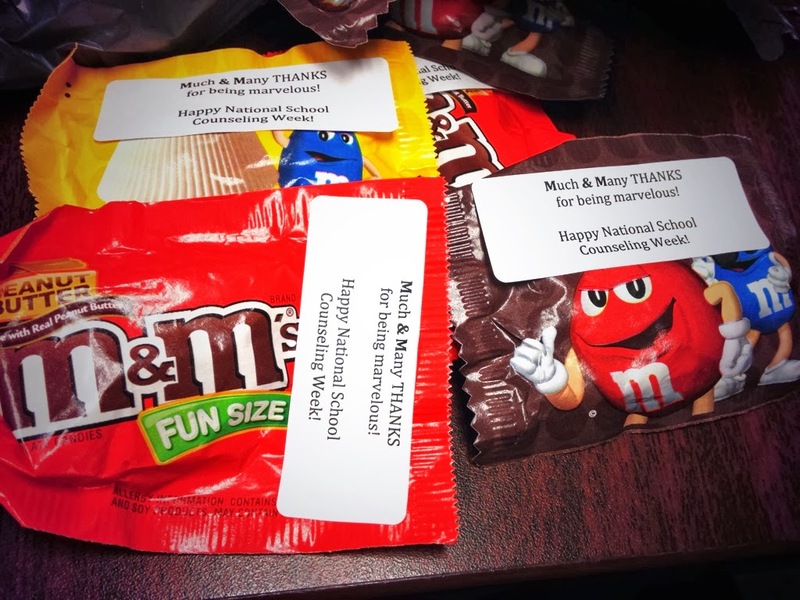 Time to celebrate National School Counseling Week! rest of the faculty, food service, and custodial staff. 2- Stick on fun size M&Ms! "Great school counselors recognize students’ fears, flaws, and fragility, and have a knack for reaching sullen and unresponsive students, as well as those who are having the time of their lives, but not attaining their full potential. ... Drama, both real and imagined, is a part of your everyday life. On occasion, a portion of your job is easy because some students are focused, mature, organized, goal oriented, supported, and secure in themselves and their relationships. More often, you work with young children, pre-teens, adolescents, and young adults who are experiencing growing pains that range from a falling out with a friend to serious and repeated abusive relationships, self-destructive behavior, or a complete and total lack of interest in their own future. Great counselors have outstanding interpersonal abilities, strong communication skills, AND an aptitude for analyzing and problem solving. On top of all that, counselors are accomplished multi-taskers."